If you are searching for the best saltwater aquarium test kit, you have come to the right place. Making an informed choice on the best saltwater aquarium test kit you get is likely one of the most important decisions for the health of your aquarium. If a fish is to thrive and survive in your care, you must make sure the water in your aquarium is the right temperature, is free of chlorine, and has a correct pH level. Failure to adequately prepare the water for your fish will lead to illness, lethargy and ultimately to their death. Experienced aquarists may be able to tell if water is suitable for their tank and its contents without outside interference, but newbies should purchase an aquarium test kit to minimize the risk of something going wrong. When you decide to purse fishkeeping as a hobby, you can expect to spend money on a tank, a filter, some decorations, and, of course, a couple of fish. It can all get rather pricey, so it is perfectly understandable that you would groan at the thought of dropping further cash on a test kit. Thankfully, also the best saltwater aquarium test kits out there can be purchased for relatively little, with many quality models selling at a reasonable price. MASTER KITS or SINGLE PIECE OF TESTING EQUIPMENT? Does a Protein Skimmer Benefit a reef Tank? When searching for the best saltwater aquarium test kit for your tank, there are a number of routes you can take. Some brands manufacture “master kits”, which are essentially package deals that include a couple of different devices and tests, so you can complete a full inspection of your water and its qualities without dropping cash on individual products. There are differing opinions as to the logic and effectiveness of master kits. Some experienced aquarists are quick to sing their praises, insisting that they offer everything a novice aquarist needs to get their tank up and running in as timely a manner as possible. Others claim that master kit manufacturers are more concerned with the quantity of their products than the quality, meaning instead of one really good water testing device you get a bunch of subpar ones. These master kit detractors also point out that the liquid treatments included in such collections tend to deplete unevenly, meaning you’ll almost certainly run out of one product sooner than the others. I myself am pretty fond of master kits and highly recommend them to novice aquarists, providing, of course, that they come from a recognized manufacturer. If you have neither the need nor desire to purchase a master test kit for your saltwater aquarium, most pieces of test equipment can be purchased individually. Just about everything commonly included in a master test kit can be found on its own, so you won’t have to worry about dropping cash on a bunch of tools you don’t want every time you need to measure your water’s pH, nitrate, or ammonia levels. Novice aquarists will likely be unfamiliar with the ideal conditions of a saltwater tank. The following table will give you a quick breakdown of the various parameters you’ll need to take into account when setting up your saltwater aquarium. While you should try to get your levels spot on, there is room to go slightly lower or slightly higher, so you won’t have to lose any sleep if you can’t match the exact numbers listed below. If you are a novice aquarist, getting anywhere near the above levels without a saltwater aquarium test kit is going to be more than a bit of a challenge. Equally challenging, however, is finding a test kit you can trust. While there are literally hundreds of thousands of saltwater aquarium test kits available, only a select few can be relied upon to accurately measure the conditions of your water. As mentioned already, failure to obtain a quality test kit will have disastrous results, which is why we have prepared the following reviews. 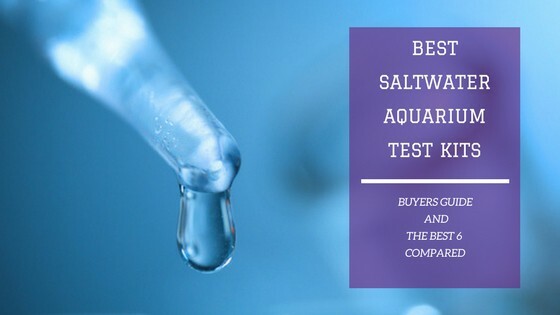 The saltwater aquarium test kits listed below are some of the best on the market and have been endorsed by some of the most experienced aquarists in the world today. Read on to find the best test kit for you and your fish. If you have been involved in fishkeeping for any amount of time, you are almost certainly familiar with the API name. API is one of the most respected and beloved manufacturers of fish care tools in the world and has been responsible for major innovations in aquarium test equipment. These 5-in-1 test strips are an excellent example of API’s dedication to quality and convenience and will allow you to test your water’s pH, nitrite, nitrate, carbonate, and general hardness levels with ease. The API 5-in-1 Test Strips are pretty flexible when it comes to the quantity purchased. API heavily promotes its 25-count packages, but the test strips are also available in smaller 4-count packages. The latter are particularly convenient if you only have a small tank to care for. These test strips are designed for use in both saltwater and freshwater aquariums, which is why they have been so consistently popular with dedicated aquarists who maintain a number of tanks with a number of breeds of fish. The API 5-in-1 Test Strips need only to be immersed in the water of your tank for a couple of seconds to accurately read the levels of its parameters, greatly simplifying a traditionally complicated process. While the simplistic design of these strips makes for a timely reading of your water, many aquarists have complained that it makes the results less trustworthy than those obtained using a more complex test kit. The API 5-in-1 Test Strips do not give a reading on your water’s ammonia level, so you may be better off purchasing a master kit instead. While the API 5-in-1 Test Strips are great if you need a quick reading of your water, they aren’t suited to long-term use and certainly shouldn’t be relied upon as the sole means of keeping track of your tank’s conditions. It is advisable to use a more complicated kit to treat and measure your water, while turning to these test strips every now and then just to make sure nothing has changed since your last complete inspection. If you’re one of the many aquarists who doubts the ability of test strips to return an accurate reading, you can be forgiven for groaning at another set appearing on this list. Don’t worry, we’ll have some products for you a little later on. Rather than skipping to the next entry, however, I suggest that you give some serious consideration to the Easy 6-in-1 Test Strips from Tetra. These strips will measure your water’s chlorine, nitrate, nitrite, alkalinity, pH, and general hardness levels. The reason a lot of test strips return inaccurate readings is that they react for long periods of time, which throws off the final measurement. The Tetra Easy 6-in-1 Test Strips stop developing at the 60 second mark, eliminating the risk of an unreliable reading. When designing these test strips, Tetra utilized technology generally reserved for medical and lab devices, making them among the most accurate test strips on the market. The Tetra Easy 6-in-1 Test Strips are available in 25 and 100-count packages, making them perfect for dedicated aquarists who routinely – if not compulsively – inspect the quality of their water. Although these test strips come with a chart to help you match color to substance, many Tetra customers have complained that the colors they turn only vaguely resemble those listed on said chart, if they resemble them at all. The Tetra Easy 6-in-1 Test Strips are quite similar to the API test strips we looked at in the previous entry. Tetra and API devotees are understandably at odds over which test strips are more effective, but all can agree that the Tetra product is incredibly impressive. While they may not be the right choice to establish the quality of your aquarium’s water, they are an affordable means of maintaining it. Preparing a saltwater aquarium is considerably more difficult than preparing a freshwater alternative as you must get the salt content just right if your fish are to be comfortable. If you want to run your saltwater aquarium based on what experienced aquarists say, you should be trying for a salinity level of as close to 3.5% as possible. Even veterans will struggle getting accurate salinity measurements with no equipment to keep them on the right track, which is why I suggest you purchase the Instant Ocean SeaTest Hydrometer. This hydrometer will measure your tank’s salt levels, as well as its specific gravity and can be purchased for a reasonable price. The Instant Ocean SeaTest Hydrometer features a full scale with easy-to-read markings, so you can be absolutely certain of your water’s salt levels. Safe zones are clearly indicated, as are the levels that are considered unsafe and dangerous. Unlike a lot of similar products, this hydrometer features a no-wet-hands design, so you won’t have to worry about getting your hands wet or dirty when testing the quality of your water. The Instant Ocean SeaTest Hydrometer is one of the most durable and accurate hydrometers on the market today. With its permanent needle mount, it is accurate to 0-001. The Instant Ocean SeaTest Hydrometer must be cleaned after every use in order to ensure it continues to perform to its highest possible standard. Failure to do so will almost certainly result in a premature decline in quality. Appropriate salinity is the basis of a successful saltwater aquarium, which is why a decent hydrometer is so important. With its durable needle, the Instant Ocean SeaTest Hydrometer will give you accurate readings for many years to come. Perhaps best of all, this hydrometer takes a historically complicated task and makes it almost effortless, so you’ll have more time to care for and admire the contents of your tank. Okay, now we’re getting into the master test kits. We encountered API a couple of entries back when we looked at its 5-in-1 Test Strips, but this is a different beast altogether. The API Saltwater Master Test Kit is arguably the most impressive and comprehensive saltwater test kit available today. It can be used to conduct a staggering 550+ tests and will allow you to keep track of your tank’s pH, ammonia, nitrite, and nitrate levels with ease. Despite its remarkable accuracy and the number of tests it can be used to complete, the API Saltwater Master Test Kit is one of the more affordable test kits out there. When discussing the Instant Ocean SeaTest Hydrometer, I listed the fact that it does not include an instruction manual as a con. This is actually a fairly common drawback with aquarium test equipment. Thankfully, the API Saltwater Master Test Kit includes a comprehensive pamphlet detailing how to detect and rectify unsafe water conditions. This kit includes four test tubes, so you can carry out multiple water tests at a time. Timing is key with this test kit. If you are told to wait five minutes to check a result, you must wait five minutes. Waiting four or six minutes will completely throw off the reading. For novice aquarists hoping to establish the conditions of their aquarium without risking an inaccurate reading, the API Saltwater Master Test Kit is the ideal product. For a reasonable price point, you will receive four test tubes that have a combined life of close to 600 tests. This extended lifespan means the API Saltwater Master Test Kit can be used in the installation of multiple aquariums or even to simply test and retest the water quality of one tank. When used in conjunction with API’s aforementioned 5-in-1 Test Strips, this master test kit will take you from newbie to expert in no time at all. The Seachem MultiTest Marine Special Test Kit is one of the most unique saltwater aquarium test kits on the market today. A collection of smaller test kits, it contains equipment necessary to test for iodine, phosphate, and silicate, which most saltwater test kits don’t offer. This kit has a combined lifespan of 75 tests. Much like the API Saltwater Master Test Kit includes four test tubes, the Seachem MultiTest Marine Special Test Kit includes a multi-cavity plate, allowing you to conduct up to four tests at a time. The folks over at Seachem took the time to prepare a detailed instruction manual for this test kit. Comprehensive and easy-to-follow, it will guide you through every step of the testing process. As well as a handy instruction manual, the Seachem MultiTest Marine Special Test Kit includes an easy-to-read reference for test validation. The Seachem MultiTest Marine Special Test Kit is arguably more expensive than some competitors similar products be and is the most pricey product to appear on this list. The tests included in the Seachem MultiTest Marine Special Test Kit are rarely found in the same collection, which for many is enough of a reason to justify the price point generally sells for. However, you will likely also have to purchase a more traditional master test kit – or at least a couple of individual pieces of test equipment – in order to properly determine the quality of your tank’s water. Measuring the calcium levels of a saltwater aquarium can be a bit of a challenge, especially because many supposedly master test kits don’t include a calcium test. The calcium level of the typical saltwater aquarium should be as close to 400 ppm as possible and the Nutrafin Calcium Test will help you get there. Nutrafin has managed to establish itself as one of the premiere manufacturers of aquarium test equipment in the world and the Nutrafin Calcium Test proves that it is more than deserving of that reputation. The Nutrafin Calcium Test is not just limited to use in saltwater aquariums. Although it may be more effective when measuring the presence of calcium in saltwater, it can also be used in freshwater aquariums, making it perfect for fishkeepers with both saltwater and freshwater pets. The Nutrafin Calcium Test boasts a total lifespan of 50 tests. This long life combined with its average price tag makes it one of the most economical test kits on the market today. This test kit is sold with two color charts – one for saltwater and one for freshwater – for you to compare your results against. The color changes this test kit relies on to share its results can be difficult to notice, so you must pay careful attention to each test to ensure it is a hit. This test kit does not include a test tube rack, so you’ll have to constantly hold the test tube in use when carrying out a test. Not big deal but this means you are limited to conducting one test at a time. The Nutrafin Calcium Test should be high on the shopping list of all novice aquarists. It provides a service not offered by most other saltwater aquarium test kits and does so with unwavering effectiveness. It is recommended that you carry out daily tests on your water’s calcium levels, so each Nutrafin Calcium Test kit should last you 50 days. That being said, daily testing isn’t absolutely essential. The thrifty fishkeeper could limit their testing to every second day and make their Nutrafin Calcium Test kit last a full 100 days. When you purchase a fish, you become as responsible for its wellbeing as you would be for the wellbeing of your dog or cat. You have a duty to provide it with the best life and living conditions you can, which is why you should view purchasing a saltwater test kit as something you have to do rather than something you might do if you have some money left over on Sunday morning. A decent saltwater aquarium test kit will help you determine the quality of your water and correct unsafe conditions. Each of the products featured here will serve to enhance the water in your aquarium, though it is advisable that you purchase one of the final four and a packet of test strips. 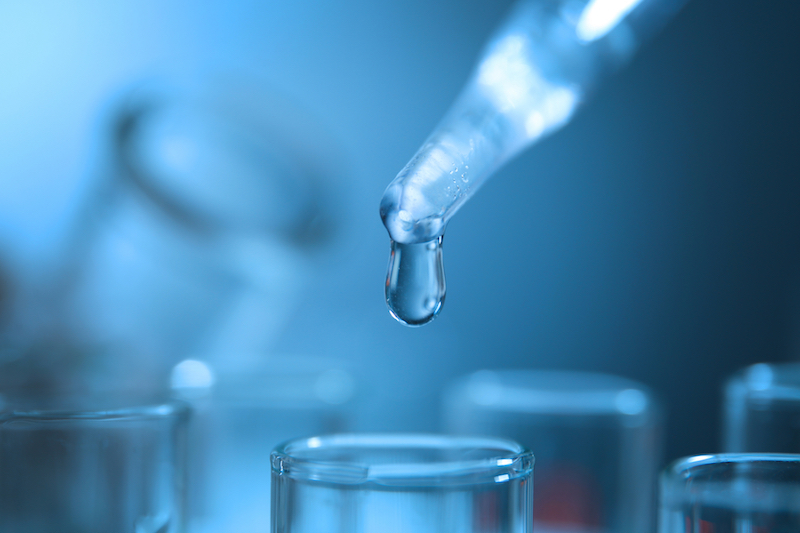 Something like a master test kit will allow you to get the parameters of your water just right, while a set of test strips will act as a time-saving means of testing the quality of the water on a daily basis to ensure no changes have occurred. This website was started from a lifelong passion for Fish Keeping and Aquariums and by the desire to share what we grasped over time. If you are a first time visitor we suggest you Start Here. We hope you find FTW fun and useful! Can Betta Fish Eat Human Food? Fishtankworld.com is a participant in the Amazon Services LLC Associates Program, an affiliate advertising program designed to provide a means for sites to earn advertising fees by advertising and linking to Amazon.com and affiliated sites. As an Amazon Associate we earn from qualifying purchases.